Candyland mínusz DiCaprio - 12 év rabszolgaság 2014.01.02. Amerika kollektív bűntudatát botrányrendező macerálja. Chiwetel Umeadi Ejiofor (London, 1977. július 10. –) Oscar-díjas angol színész. Chiwetelu Umeadi Ejiofor was born on July 10, 1977 in Forest Gate, London, England, to Nigerian parents, Obiajulu (Okaford), a pharmacist, and Arinze Ejiofor, a doctor. Chiwetel attended Dulwich College in South-East London. By the age of 13 he was appearing in numerous school and National Youth Theatre productions and subsequently attended the London Academy of Music and Dramatic Arts. In 1996 Ejiofor caught the attention of 'Steven Spielberg' (qv) who cast him in the critically acclaimed _Amistad (1997)_ (qv) alongside 'Morgan Freeman (I)' (qv) and 'Anthony Hopkins (I)' (qv). He has since been seen on the big screen in numerous features including 'Stephen Frears' (qv)' _Dirty Pretty Things (2002)_ (qv) (for which he won Best Actor at the British Independent Film Awards, the Evening Standard Film Awards, and the San Diego Film Critics Society Awards), _Love Actually (2003)_ (qv), 'Woody Allen' (qv)'s _Melinda and Melinda (2004)_ (qv), _Kinky Boots (2005)_ (qv), _Inside Man (2006)_ (qv), _Children of Men (2006)_ (qv), _American Gangster (2007)_ (qv), and _Talk to Me (2007)_ (qv), for which his performance won him an Independent Spirit Award for Best Supporting Actor. Ejiofor has balanced his film and television commitments with a number of prestigious stage productions. In 2008 his performance in the title role of 'Michael Grandage (I)' (qv)'s "Othello" at the Donmar Warehouse alongside 'Ewan McGregor' (qv) was unanimously commended and won him best actor at the 2008 Olivier and Evening Standard Theatre Awards. He also received nominations in the South Bank Show Awards and the What's On Stage Theatregoers' Choice Awards in 2009. His other stage parts include 'Roger Michell (I)' (qv)'s "Blue/Orange" in 2000 which received an Olivier Award for Best Play, and the same year 'Tim Supple' (qv)'s "Romeo and Juliet" in which Ejiofor took the title role. Following his television debut in 1996 in _Deadly Voyage (1996) (TV)_ (qv), Ejiofor has complimented his film and theatre work on the small screen in productions including _"Murder in Mind" (2001)_ (qv), created by the award-winning writer 'Anthony Horowitz' (qv), _"Trust" (2003)_ (qv), _Twelfth Night, or What You Will (2003) (TV)_ (qv), and _"Canterbury Tales" (2003)_ (qv). His television appearance in 2006's hard hitting emotional drama _Tsunami: The Aftermath (2006) (TV)_ (qv) alongside 'Toni Collette' (qv), 'Sophie Okonedo' (qv) and 'Tim Roth (I)' (qv) earned him a nomination for a Golden Globe Award as well as an NAACP Image award. Ejiofor also appeared in such notable films as _Endgame (2009/I)_ (qv), Channel 4's moving drama set in South Africa for which his performance earned him a Golden Globe nomination for Best Performance by an Actor in a Miniseries; 'Roland Emmerich' (qv)'s action feature _2012 (2009/I)_ (qv), opposite 'John Cusack (I)' (qv), 'Danny Glover (I)' (qv), and 'Thandie Newton' (qv); and _Salt (2010)_ (qv), opposite 'Angelina Jolie' (qv) and 'Liev Schreiber' (qv). In 2013, he starred in _Half of a Yellow Sun (2013)_ (qv) and _12 Years a Slave (2013)_ (qv), receiving an Academy Award nomination for Best Actor for the latter film. Michael Fassbender (Németország, Baden-Württemberg, Heidelberg, 1977. április 2.) ír-német színész. Legismertebb szerepei Archie Hicox hadnagy a Becstelen brigantyk című háborús filmben, Magneto az X-Men: Az elsők című, illetve az X-Men: Az eljövendő múlt napjai című szuperhősfilmekben, David és Walter a Prometheus és az Alien: Covenant című sci-fi-horror filmekben és Edwin Epps a 12 év rabszolgaság című történelmi drámában, amelyért Oscar-díjra jelölték. Szerepelt még például a 300 című történelmi akciófilmben; az Éhség című életrajzi filmben; az Akvárium című filmdrámában; a Jane Eyre című romantikus filmben; a Veszélyes vágy című történelmi filmben, amelyben Carl Gustav Jung pszichológust alakította; és A szégyentelen című filmdrámában is, sőt ez utóbbi filmben nyújtott alakításáért megnyerte a Volpi Kupát a 2011-es Velencei Nemzetközi Filmfesztiválon mint a legjobb férfi színész, valamint Golden Globe-díjra és BAFTA-díjra is jelölték. Michael Fassbender was born in Heidelberg, Germany, to a German father, Josef, and an Irish mother, Adele (originally from Larne, County Antrim, in Northern Ireland). Michael was raised in the town of Killarney, Co. Kerry, in south-west Ireland, where his family moved to when he was two years old. His parents ran a restaurant (his father is a chef). Fassbender is based in London, England, and is known for his roles in the films _Inglourious Basterds (2009)_ (qv), _X-Men: First Class (2011)_ (qv), _Shame (2011)_ (qv) and _12 Years a Slave (2013)_ (qv). Paul Franklin Dano (/ˈdeɪnoʊ/; born June 19, 1984) is an American actor, director, screenwriter, producer and musician. Dano started his career on Broadway before making his film debut in The Newcomers (2000). He won the Independent Spirit Award for Best Debut Performance for his role in L.I.E. (2002) and received accolades for his role as Dwayne Hoover in Little Miss Sunshine (2006). For his dual roles as Paul and Eli Sunday in There Will Be Blood (2007), he was nominated for the BAFTA Award for Best Supporting Actor. Dano has also received accolades for roles such as John Tibeats in 12 Years a Slave (2013) and Alex Jones in Prisoners (2013). 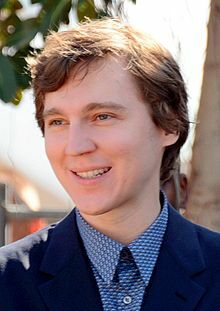 His acting portrayal of musician Brian Wilson in Love & Mercy (2014), earned him a Golden Globe nomination in the category of Best Supporting Actor. Dano made his directorial debut with the 2018 drama film Wildlife, based on the novel by Richard Ford and starring Carey Mulligan and Jake Gyllenhaal. He co-wrote the screenplay with his partner Zoe Kazan.